After Season 1, I always said David Tennant and RTD were superior and I always got rage neggd. I'm glad after Season 2 people finally agree with me. No. And those specific examples are examples of 'Doctor Who' going silly and why the majority prefer DT. 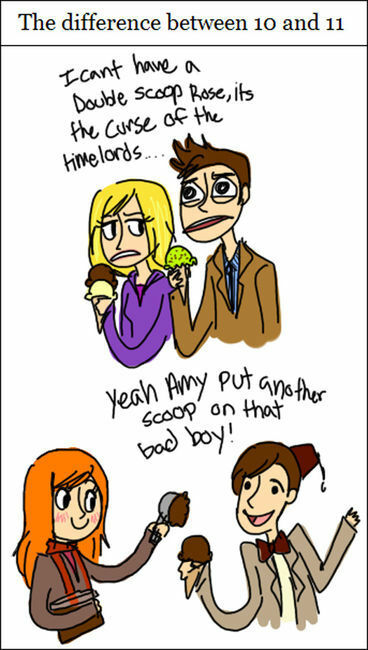 I prefer RTD as a writer and like matt and david equally as the Doctor. Russell T Davies and David Tennant. I like Matt Smith a lot (and more than I expected to) but Tennant will always be my Doctor and I think Davies helped make him the best Doctor ever (in my view). Moffat's episodes recently have been a bit bleurgh so I guess in that sense, Matt Smith has been very successful to still make Doctor Who enjoyable. With a weaker actor and equally weak plotlines, I would probably have lost interest. I think that Moffat is better at writing when he's got longer episodes to write, his Sherlock episodes and the two-parters of Doctor Who he's written have all been brilliant, yet some of the shorter ones he's written sometimes feel a bit rushed, I would absolutely love it if RTD came back to write the shorter episodes and Moffat writes the two-parters. When the first episode of the new series started I didn't quite believe the saying about hinding behind the sofa. But after The Empty Child, I now do. Never has such an innocent a word as 'mummy' ever been so scary. I went on a WWII school trip a few days after that episode. You could spot the Doctor Who fans a mile off because they were all terrified by the gas masks on display. Sorry? I thought this was a thread about people posting different opinions? Okay so the majority think DT is better that's fine, I love DT too- but I thought the whole point of this thread was to have both points of view? It'd be boring if everyone liked the same things and didn't have any other opinions, so why'd you dismiss my opinion just because it is different from yours, especially since this thread welcomed both views? But you can see why those examples are silly right? As in they're silly to use or Matt Smith being silly? They are examples of Matt Smith being a bit sillier as the Doctor, but I think that's what makes Matt Smith so brilliant it makes him much more an alien, and his quirky goofiness has I think put Doctor Who back into the emphasis of being a sci-fi show with drama rather than the shift I think DT had of it being drama with sci-fi. Yeah there were aliens and yeah he had a time space machine, but I think in DT's era that was almost a background to the relationship plotlines. Oh I'm not sure which to choose overall. David Tennant was an amazing actor and really gave the Doctor an emotional value which obviously helped an enormous amount in engrossing me in the storylines. But I personally think that Matt Smith is just as good an actor but has a completely different style. Albeit controversial, I actually think that Matt Smith portrays the Doctor's personality in a style which seems more befitting. I've always thought that the Doctor would be someone who's completely erratic and barmy and it's nice to have a break from constant emotional turmoil. Although, Matt Smith has definitely come off worse in terms of plot lines. With Moffat there seems to be some amazing underlying convoluted 'wow-factor' plot; but it means that every other episode that doesn't directly relate to that plot seems to be a bit like poorly planned 'filler'. On an unrelated note, I absolutely adore Alex Kingston's portrayal of River Song! Matt Smith and Moffat. RTD made Tennant a charachter from Eastenders. If he wasn't following Billie Piper around like a puppy, which for a time lord is basically beastiality, he was either gnashing his teeth or apologising. I half expected Tennants episodes to end with the typical eastenders drumroll. On the other hand Smith has managed to create his own Doctor, different from Tennant yet you know its still the same guy. He bring comedy to the role which Tennant didn't. Really? I don't think I've laughed once.. I think I laughed more when the 10th Doctor put on that gask mask as a joke and said "are you my mummy"
I suppose the comedy aspect of each actor is down to personal preference. I just think Smith is a better actor for the role of the doctor. Both David Tennant's and Matt Smith's first series' were quite good but apart from that they were both awful. I think I prefer Russell T Davies' writing to Steven Moffat's, I know I definitely prefer RTD on a more "personal" level. Ugh, yeah! I hated Love & Monsters. I know it was supposed to be a happy, heart warming episode, but the creature effects and the smushy story were so cringe inducing I don't think I made it through the whole hour! Hehe! I have got to get one of those gas masks. Halloween this year would be sorted. Ugh, yeah! I hated Love & Monsters. I know it was supposed to be a happy, heart warming episode, but the creature effects and the smushy story were so cringe inducing I don't think I made it through the whole hour!. I thought early Tennant was the best but Matt Smith is more consistent. As for the writers, I'd prefer Moffat if he started living up to the episodes he wrote during the RTD era but overall it has to be RTD sadly.